Mie Fujitsu Semiconductor of Japan has added a new production line based on advanced, environmentally-friendly technologies to its Mie plant in Kuwana, Mie Prefecture. The cleanroom is equipped throughout with a Swirling Induction Type HVAC System (SWIT) from Takasago Thermal Engineering, which will have a smaller environmental footprint than conventional systems while ensuring high-quality manufacturing. This is the world’s first use of this technology in wafer fabrication cleanrooms for semiconductors, says the company. Seeking to design and build an environmentally friendly eco-plant, Mie Fujitsu Semiconductor and Takasago Thermal Engineering focused on reducing the plant’s environmental footprint while maintaining safety and reducing the construction time. For the HVAC system in particular, it chose the most advanced technology and has built a system that offers outstanding energy efficiency. The SWIT HVAC creates temperature strata inside the cleanroom, and works with rising air currents created by heat-generating equipment to carry airborne dust toward the ceiling. This makes it possible to efficiently maintain a steady temperature in the work areas at lower elevations in the room, therefore the volume of air being supplied can be lower than in conventional HVAC systems. In addition, because this allows for air to be supplied at a higher temperature, the chilled-water temperature can also be higher, which contributes to energy savings. Compared with existing systems, the annual energy used is expected to be around 47% lower for transport power and roughly 32% lower for heat-source power (based on estimates for HVAC transport power and cleanroom-load handling chillers). Additionally, this system helps to simplify building construction, contributing to a shorter construction process and lower construction costs. 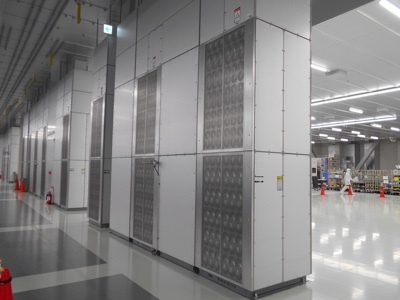 Mie Fujitsu Semiconductor is building the cleanroom to run a 40nm process line. Due to go into service in 2016, it will provide customers with ultra low-power technologies and embedded non-volatile memory technologies, for the IoT market and automotive electronics.